Work commenced on construction of the new Speedway at the Shay on the 8th of Febuary 1949 with the first meeting to be held on the 6th of April 1949. 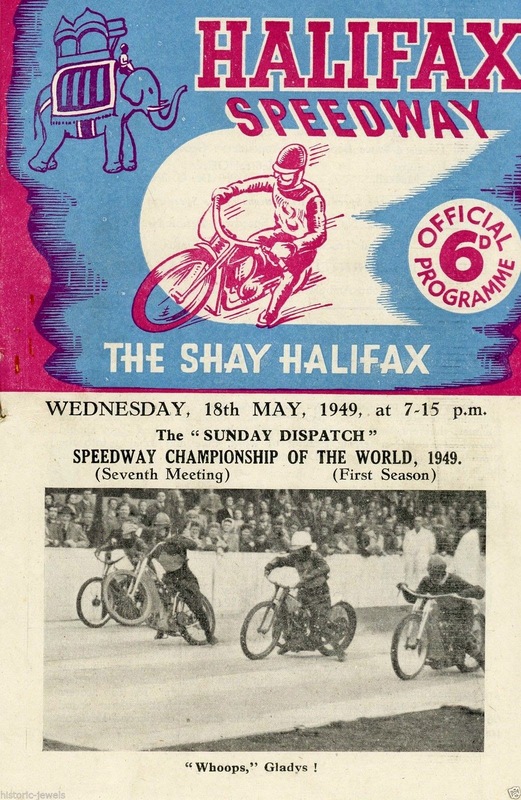 Speedway at the Shay was not working, with poor attendances the club was in financially in trouble. On the 10th of November 1951 Speedway promoter Bruce Booth tried out midget car racing at the Shay, the gate tripled for that of meeting with a claim of 15,000 spectators. Bruce Booth would call it a day in 1952 and the Speedway would close. 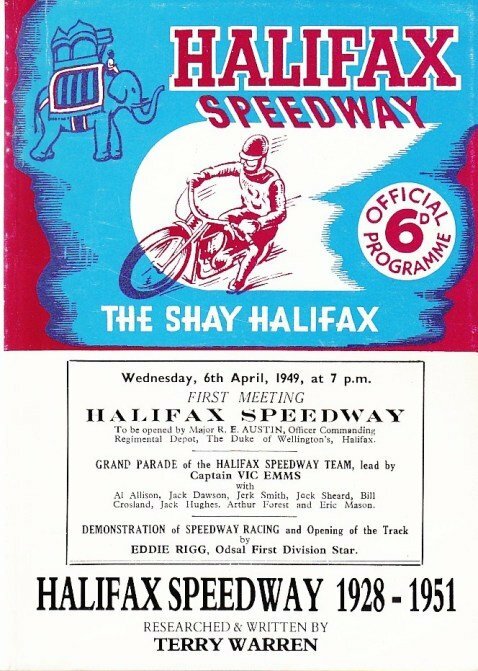 In November of 1962 Reg Fearman who was promoting Middlesbrough at the time saw the potential of the Shay and made application to the Halifax Town to revive the Speedway. Reconstruction began in early 1965 and the track was soon open, this time around the Speedway was a huge success, so much so that it started to draw more interest than the football club their co tennent, the relationship between the two clubs would sour over time with disputes over money etc and the Speedway would leave the Shay and move to Bradford in 1986. 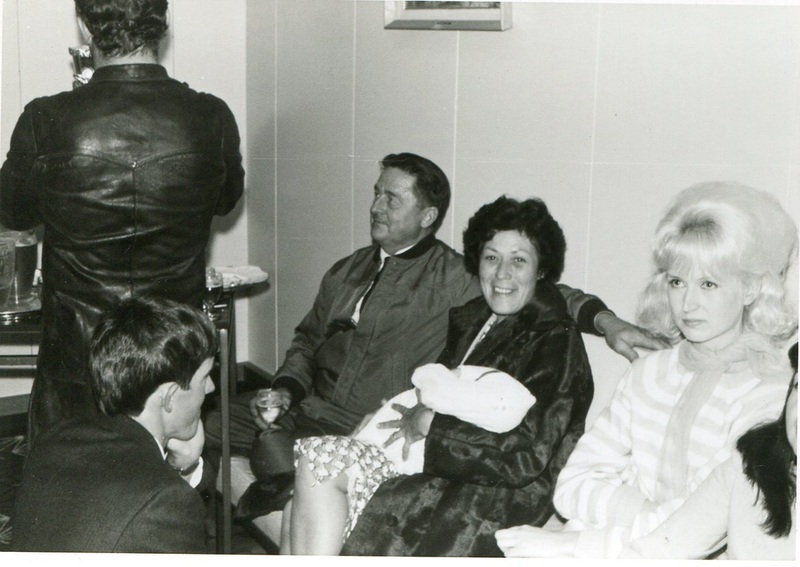 Pictured below is the Great man Aub Lawson and his wife Roma at a party with Les Sharpe (nealing) Aub Lawson played a major roll in getting Les a spot with the Halifax team in England. The move to Bradford would see also a name change for the solo team, they would now be known as the Bradford Dukes as opossed to the Halifax Dukes. Allthough speedway racing had moved from the vevue in 1986, an infield grass track motorcycle event was held 12 months after the closing, the old speedway track at this point was still untouched and fit for racing.